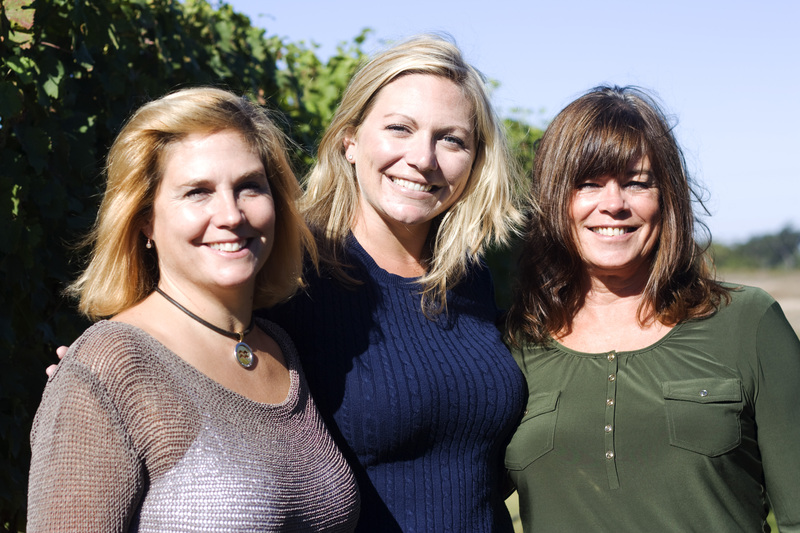 At first, the original 20-acre property was called Lieb Vineyard when it was established in 1992 by Mark and Kathy Lieb, but soon after, a new entity, Lieb Family Cellars, was created. Today both are under the rubric of Lieb Cellars. Because the vineyard has no winery of its own, at the beginning it used the winery facilities at Palmer Vineyards, and then those of Lenz Winery, where Eric Fry is the winemaker, but as of 2000 it has used the custom-crush facilities of Premium Wine Group (PWG), itself co-founded by Mark with Russell Hearn. By 2001 Lieb’s tasting room at PWG was opened and it began acquiring more land for vinifera vines. In early March 2013 PWG and Lieb Cellars came under the ownership of Southport Lane, a private equity firm. Peter Pace, a marketing executive with long experience in the spirits industry, was appointed as Managing Director of Lieb Cellars this past March, and Russell Hearn is Directing Winemaker of PWG and the winemaker for Lieb. Lieb’s vineyards have been sustainably managed since its founding and it recently has been awarded a USDA grant of more than $23,000, which will help it support its management practices and sustainable viniculture over the next ten years. 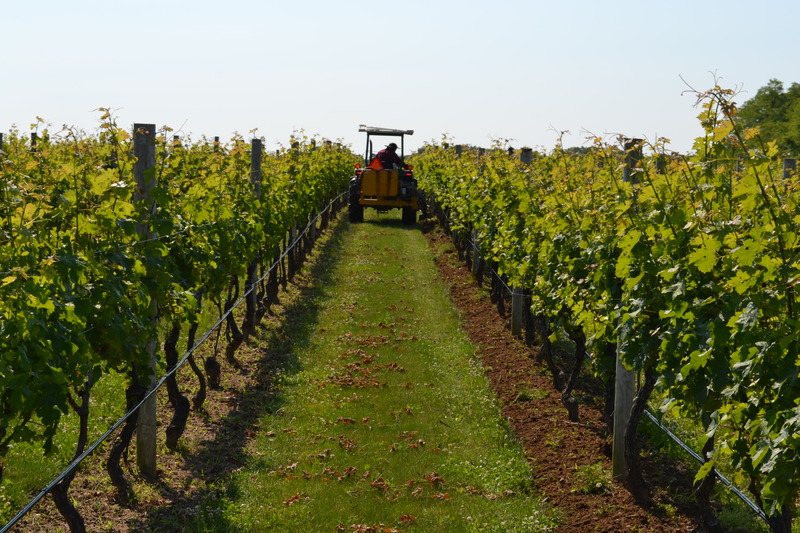 Indeed, it has also joined the Long Island Sustainable Winegrowing program—its conversion to the programs guidelines and regulations should be straightforward, given that it already follows the VineBalance sustainable program by Cornell’s Agricultural Extension. I met with the management staff at the tasting room on Oregon Road, Sarah Kane who is Director of Operations, as well as her colleagues Logan Kingston and Jean Partridge. They were very helpful and plied me with tastings of various Lieb wines—as the saying goes, liquor is quicker. We spoke about many things, including Lieb’s operations and its long-term plans for expansion, We spoke about many things, including Lieb’s operations and its long-term plans for expansion, and some of our conversation was quite philosophical and very interesting. Indeed, I’ll have to write a separate post for the discussion that we had, for there were some excellent insights into what the challenges are for Long Island wine producers, particularly with respect to competition and the selling of the wine in the larger marketplace. What was clear was their passion and commitment to not just Lieb, but Long Island wine as a whole. 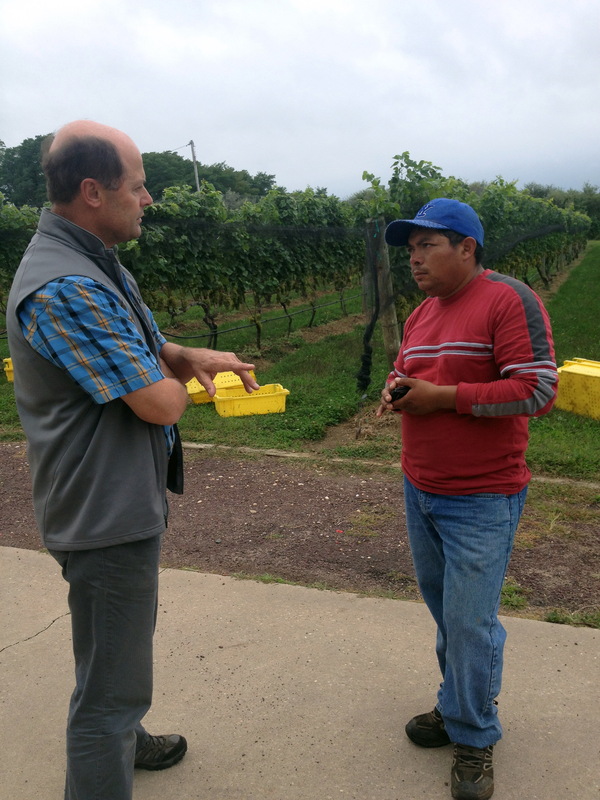 But when it came to discussion of the viticultural practices of the operation, they got me in touch with the head of the vineyard crew for the original Lieb parcels, Jildo Vázquez, originally from El Salvador, who has been with Lieb for the past sixteen years. He’s held in very high esteem by the staff who cannot praise him enough for his work ethic, skill, and dedication. Jildo came in from the vineyards where he’d been working on a tractor when I asked to speak to him. Speaking in Spanish, I asked him what he and his crew did to bring quality fruit grown sustainably to the winery. Rather shy and very soft-spoken, particularly with a stranger, even though speaking Spanish, I had to draw Jildo out. He answered my questions very simply and directly: “Well, this first thing that we do is check that each vine is health and clean. Then we make sure to spray them as needed.” When I asked him what kind of sprays he uses, he said, “I don’t know, as I don’t do it. I dedicate myself to making sure that the plants are clean.” It turns out, according to him, that there are individuals who are trained to do that particular job and must be properly licensed. It wasn’t enough that a sprayer have the requisite experience; he needed, as Jildo put it, “to have the backing of the law.” An answer, I thought, that was very reassuring in the context. For that reason, he only maintains the vines and keeps them clean of any diseases that may threaten them. Towards the end of the season and just before the harvest he’ll spray the vines to clean them of any bacterial or fungal growths. He also ensures that each vine has no more than fourteen or sixteen shoots so that it grows well. I asked about the use of fertilizers and he told me that though he knows that they are used in some places, they are not employed at Lieb because they can adversely affect the vines. With respect to using machines to harvest the grapes, he made a point of explaining just why they aren’t used at Lieb: they gather not only fruit, but also leaves, stems, bird droppings, damaged fruit, dirt, and so on. That’s why they only pick by hand—the harvested fruit is clearly superior. As his replies suggest, this is a vineyard that is closely and carefully managed, and the quality of the fruit shows in their wines. Jildo has been collaborating with Russell Hearn closely since PWG began making Lieb’s wine thirteen years ago, especially now that the two firms have been merged. Jildo is himself a gifted winegrower, as Russell himself attests, given that with his long experience and acute eye he’s able to see if anything is wrong with a vine, and even without tasting can visually see when a vineyard is ready to harvest. Russell thinks very highly of Jildo and enjoys working with him. During the growing season, Russell goes out into the vineyard about once a week, and during the harvest he goes every day with Jildo. As Logan pointed out, Jildo is extremely dedicated, and with the acquisition of the Peconic Bay vines he has been getting up at 5:30 every day and doesn’t quit until 7:00 in the evening. He has a crew of eight, some of whom have been working with him for years. At present Lieb has its vineyards planted to Chardonnay, Cabernet Franc, Merlot, Pinot Blanc, and Petit Verdot, as well as Cabernet Sauvignon, Pinot Noir, Viognier, Sauvignon Blanc, and Riesling. Some of the vines were planted as far back as 1982. Indeed, Lieb/PWG (Southport Lane) has taken control of Peconic Bay’s vineyards, as the latter is has just put its winery up for sale. That’s an additional 58 acres in two large parcels, in consequence of which Lieb has hired Steve Mudd, a long-time wide-ranging vineyard consulting manager in the East End to help run Peconic Bay’s Main Road vineyard and Bill Ackerman of North Fork Viticultural Services (NFVS) who works the one on Oregon Road. The two men coöperate on certain aspects of the management of the fields, particularly with respect to the sprays to use. Ackerman mixes his sprays at his own property and then brings in his equipment into all the vineyard parcels, using double-curtained machines that help keep the sprays contained and partially recycled. And then there are the Lieb wines. For starters, Sarah pointed out that Lieb Cellars’ 91-point Blanc de Blanc brut sparkling wine, made entirely of Pinot Blanc, which we were tasting during the interview, was the result of the cooperation of two winemakers: Eric Fry of Lenz Vineyards, who made the dosage, and Russell, who finished the making of the wine. In fact, Lieb has employed the gifts of Eric to make dosages for the last twelve years, other than the 2009, which was entirely Russell’s effort. Eric, according to Sarah, has the right palate for the Pinot Blanc sparkler that Lieb so famously makes. Tom Collichio’s Craft Restaurant house sparkler —is made by Russell as well as another for Topping Rose House, another Collichio restaurant. 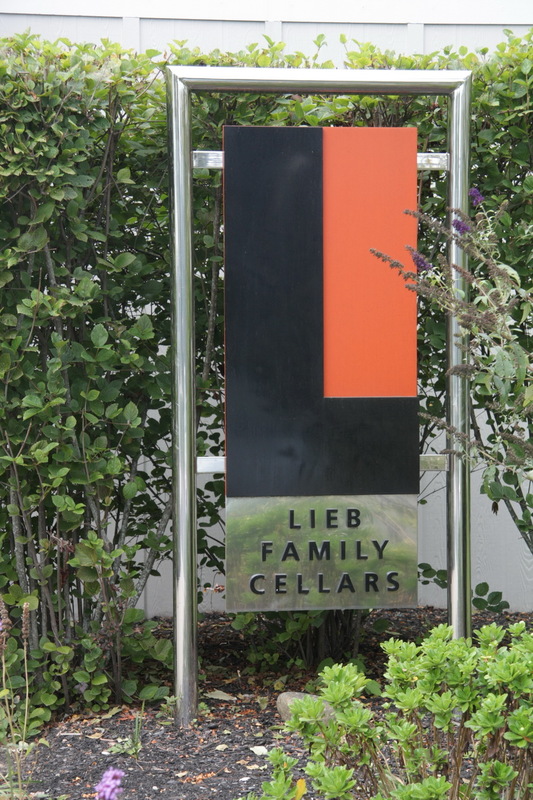 Essentially, Lieb has two brands: Lieb Cellars, which includes the Reserve wines, and Bridge Lane, its second label (right). I’ve tried most of their wines, of which I have purchased several over the years and a few of which are still in my cellar. All of them, without exception, are clean, well-made, and taste true to the varieties from which they are made. 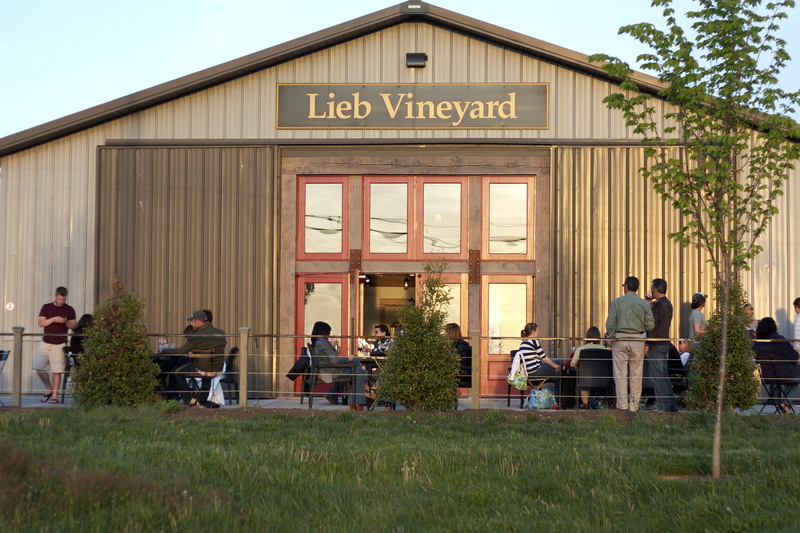 Lieb is especially well-known for both its award-winning Pinot Blanc sparkler and its also medalled Pinot Blanc Reserve wine. I’m also especially fond of the 2008 Cabernet Franc, which is wonderful to drink, mature and ready now, or cellared for a few years more. One that I’ve not yet tried is the White Merlot, where the grapes are picked early in the harvest season and crushed without any skin contact. From its description on the Lieb Website, it sounds intriguing. Bridge Lane is being rebranded and is the first label in Long Island to sell wine in boxes, according to a piece by Eileen Duffy, just published in East End Magazine on Feb. 5, 2014: Forget Screwcaps, Lieb Puts Second Label, Bridge Lane, in Boxes.
. . . formerly known as the Long Island Merlot Alliance, [which] announced today that Lieb Cellars has joined its ranks and that two barrels of Lieb Cellars’ Merlot will be included in the 2012 vintage of Merliance, the group’s cooperative merlot blend. This move isn’t surprising. Acquired along with Premium Wine Group by private equity firm Southport Lane earlier this year, Lieb Cellars is now under the business leadership of Peter Pace and technical direction of Merliance co-founder winemaker Russell Hearn. With the addition of Lieb Cellars, the Merliance has seven members, including Clovis Point, McCall Wines, Raphael, Sherwood House Vineyards, T’Jara Vineyards and Wölffer Estate Vineyard. This entry was posted in Vineyards, Viticulture, Wineries and tagged Bill Ackerman, Eric Fry, Jean Partridge, Jildo Vazquez, Kathy Lieb, Lieb Cellars, Lieb Family Cellar, Lieb Vineyard, Logan Kingston, Mark Lieb, NFVS, North Fork AVA, North Fork Wineries, Peconic Bay Winery, Peter Pace, Premium Wine Group, PWG, Russell Hearn, Sarah Kane, Southport Lane, Steve Mudd on 8 October 2013 by JoseM-L.